Do you feel like you’re drowning in credit card debt? Does it feel like you’ll never pay off what you owe, because so much of your money is going toward the black hole of high interest rates? Once you’ve gotten behind on your credit card payments and your balance has crept up, month after month, your debt can feel like a runaway train that’s impossible to catch. But good news! Doing a balance transfer to a low-interest – maybe even a zero-interest – credit card can put the brakes on your balance and speed up the progress of your payments, allowing you to catch up and pay off your balance in full. Paying off your balance faster and saving hundreds, maybe even thousands of dollars in the process sounds great, but how do you do it? If you have a good credit score, you probably get lots of offers for balance transfer credit cards – how do you know which one to choose, and what’s the next step once you’ve chosen? 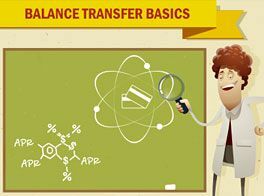 Doing a balance transfer doesn’t have to be tricky, but there are some things you need to know first. This infographic breaks the process into three easy steps – first, ask questions, second, make the transfer, and third, hold on to that low interest rate! Read on to find out what questions you need to ask before accepting a balance transfer offer, how to actually make the transfer, and what to do once your new balance transfer card is active. history that will help you save money on Balance Transfers.